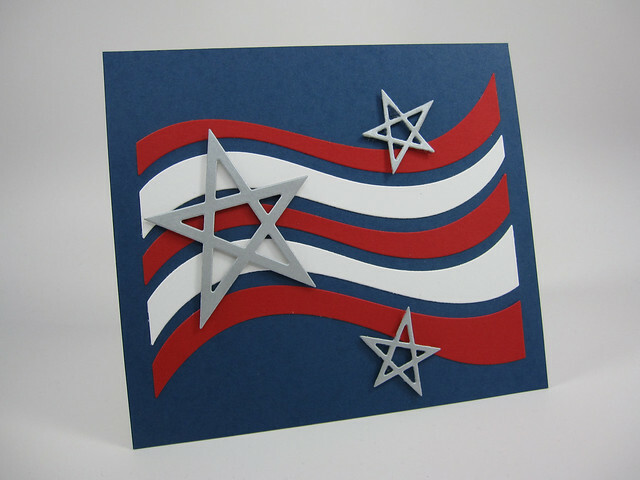 The Ellen Hutson July Pin-Sight challenge inspiration for July is all about beautiful shades of red, white and blue that we associate with summer and the Fourth of July. Here is my take on the red, white, and blue theme. Cardstock: Ranger Distress Watercolor Cardstock; Neenah Solar White 110# for the card base; Stampin’ Up: Cherry Cobbler; red glitter paper (from my stash), Bazzill Vellum 40#. Stamps: Essentials by Ellen: Fancy Thanks. Dies: Essentials by Ellen: Wild Garden; Lil’ Inder Designs: Stitched Mats: Rounded Rectangles. Other: WOW embossing powder in Gold Rich Pale; Pretty Pin Posh Clear Sparkling Sequins (4mm and 6mm); 3M Scotch double-sided foam tape. Summer is not summer without sunshine and a more laid-back attitude. Here is my take on summer. This card was created for the Simon Says Stamp’s Challenge #23. The objective was to incorporate die-cutting in you project. I was aiming for a bright, summery look and I hope I captured that in this card. Stitched Rectangles (the next largest size down from the set) and centered the die in the middle of an A2 (4.25” x 5.5”) turquoise blue piece of cardstock. This formed the frame for my project. The sun with the spike rays, Sunshine Die is a die that coordinates with the SSS My Sunshine stamp set. Relax die which is a word die. The large sun from the My Sunshine stamp set was first stamped in a bright orange ink and then die cut using the Sunshine die. An A2-sized piece of white card stock was glued to the back of the frame. The Relax die was placed on the card front and die to form a negative space. I then die cut and the word again from green cardstock and inlaid the individual letters into the negative area. 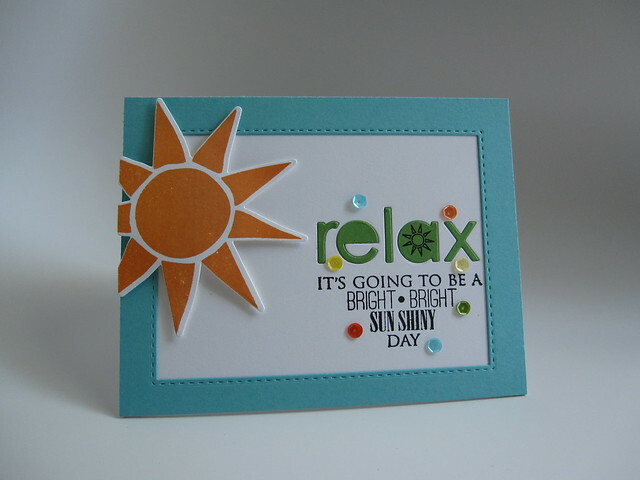 The sentiment below the word “relax” is also from the My Sunshine stamp set and was stamped in black ink. Note that the center of the “a” in the word “relax” was stamped with a tiny sun image (also from the My Sunshine stamp set) in black ink, this was to emphasize the sun theme. Sequins were added for additional interest and sparkle. Hope you like this card and go out and enjoy the Sun (but please apply sunscreen first)! Stamps: Simon Says Stamp: My Sunshine stamp set. Dies: Simon Says Stamp: Relax die; Sunshine die; Stitched Rectangles dies. Inks: Papertrey Ink: Orange Zest; Versafine Ink: Onyx Black. Cardstock: Neenah Solar White: 80# for card front and large sun image and 110# for the card base; Papertrey Ink: Hawaiian Shores (for card front frame) , New Leaf for letters spelling the word “relax”. Other: Sequins from my stash. Summer is well under way, so, this is a belated happy summer wish! I love making cards that have a bit of whimsy to them. I could say that the ants are on a picnic or that they’re being pests at a picnic. Not only do I love whimsical cards, but I also love hoarding purchasing cute little stamp images. This A2 card was designed using some current stamps and images that I’ve hoarded collected and can’t part with. The image of the picnic basket and picnic blanket is from an Elzybells stamp set. Elzybells is a brand no longer available I’m sad to say and I became a fan of this brand too late, just as it was closing its line of stamps. I was in the early stages of my card making addiction back thenand I started to buy Elzybells stamps from their close out sale a few years ago. The thing about Elzybells was the images were fun and had a certain delicacy about them. You may still be able to find some of these stamps on eBay or the like. The images were and still are adorable. So, I apologize for using some items which are readily available to crafters. Maybe you can find similar images that currently available elsewhere. Again, I apologize. However, the Lawn Fawn ant images and greeting are still available. 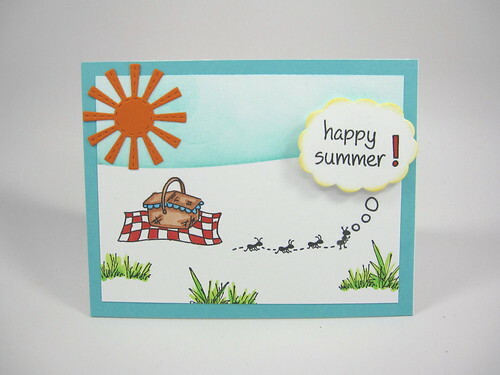 I used L/F’s Happy Summer mini stamp set in this card. I love this whimsical set as well. The little tufts of grass in this card set are from Stamps by Judith & Heather. This stamp maker has the cutest little rubber stamp images which you can purchase individually. I tend to buy small little stamps that I think may be useful in my card designs both now and in the future. I’m always on the lookout for cute, versatile images. The coloring of the images were all done using Copic markers and the orange sun in my sky is a die from Lil’ Inkers Designs called Sunshine (it is the larger-sized die, since there is also a smaller one). I think Lil’ Inkers Designs was one of the first companies where I noticed the use of piercing in their dies. Hope you like my summer greeting. Let me know if in the comments section if you want more specific details about this card. Stamps: Elzybells as mentioned above; Lawn Fawn: Happy Summer stamp set; A Birdie Told Me (thought bubbles image and exclamation point); Stamps by Judith & Heather: Loose Grass and Grass Tuft images. Dies: Lil’ Inkers Designs: Sunshine die (larger); Lawn Fawn: A Birdie Told Me – Lawn Cuts (the cloud bubble die). Cardstock: Papertrey Ink: Hawaiian Shores, Orange Zest: Neenah Solar White: 80# for card front, 110# for card base). This card was made for the Simon Says Stamp card challenge #22. The challenge is to incorporate rainbow colors in your project. For my project, I made a card larger than the standard A2 size. The card front is about 5.25” wide by 5.75” long. The reason for doing this is that I didn’t want to trim down all my rainbow color blending! I started by prepping a six-inch square of Neenah Solar White 80# cardstock for the front of the card with an embossing buddy. I stamped the card front with the SSS Drawn Heart background stamp inked with Versamark Ink. The inked card front was then heat embossed using Hero Arts white embossing powder. 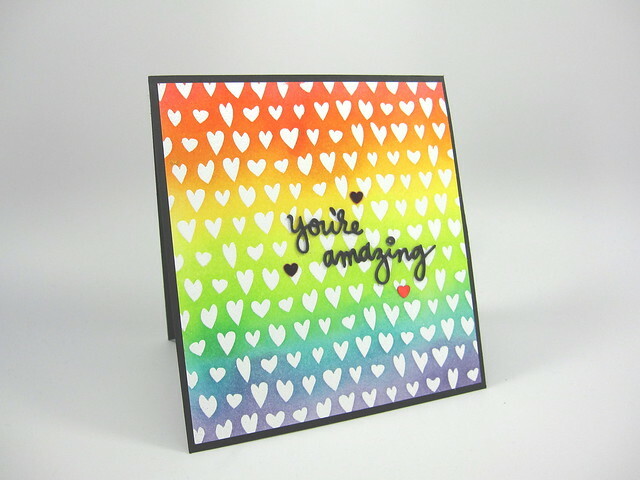 I then started ink blending the front of the card in rainbow hues with Distress Inks. The colors I used (from top to bottom) were: Abandoned Coral (love this new color! ), Spiced Marmalade, Squeezed Lemonade, Twisted Citron (love this summery green! ), Peacock Feathers, and Dusty Concord. I trimmed the front down to 5.25” by 5.75” to get rid of all the “scraggly” embossed edges and mounted the front onto a 5.5” by 6.00” black card base. Note: I had to rig a card base from 2 pieces of black cardstock for the final unfolded base to be 5.5” x 12”. The sentiment “You’re Amazing” is SSS’s You’re Amazing wafer thin die. The sentiment was die cut 3 times from black cardstock and the 3 layers glued on top of each other with Ranger Multi Matte Medium. A charcoal-colored sequin was used to dot the “I” in the word “amazing” and 3 red-colored confetti heart sequins were glued around the entire sentiment for emphasis. Stamps: Simon Says Stamp Drawn Heart background stamp. Dies: Simon Says Stamp You’re Amazing wafer thin die. Inks: Distress Inks: Abandoned Coral, Spiced Marmalade, Squeezed Lemonade, Twisted Citron, Peacock Feathers, Dusty Concord; Versamark Ink. Cardstock: PTI: True Black, Neenah Solar White 80#. Other: Hero Arts white embossing powder, Pretty Pink Posh: Charcoal sequin (4mm); Red Confetti Hearts.